Counsilman-Hunsaker, in association with Altimira Design and Common Sense Inc., designed Bogan Park, an indoor water recreation facility for the Lawrenceville community. The natatorium was designed to provide an open, airy effect between two pools: one competition and one leisure. Spacious windows allow for plenty of natural sunlight while defraying overhead electrical consumption. The 25-yard competition pool with six lap lanes includes springboard diving and is utilized for fitness swimming and aquatic classes, including swimming lessons and water aquacise, and training for local swim teams. The leisure pool features a waterslide, which zigzags riders into a waiting splash down pool. 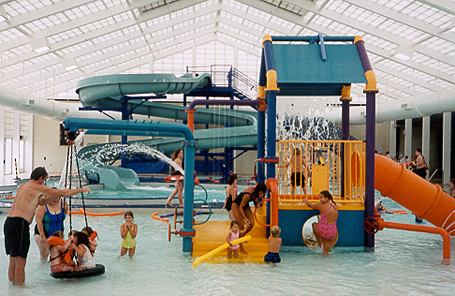 Kids can climb, slide, swing, and splash on the colorful aquatic playground. Water bollards spew steady streams into the pool, while watersprays provide rain-like showers to swimmers. Guests can also spin in the cyclonic waters of the vortex or go for a lazy float in the current channel.